Wedding planning is no joke, but there are elements of the planning process that I’ve found to be a lot of fun. The first of which is making my bridesmaid proposal boxes. I’ve just recently started to see this trend on instgram and I thought it was the cutest thing! 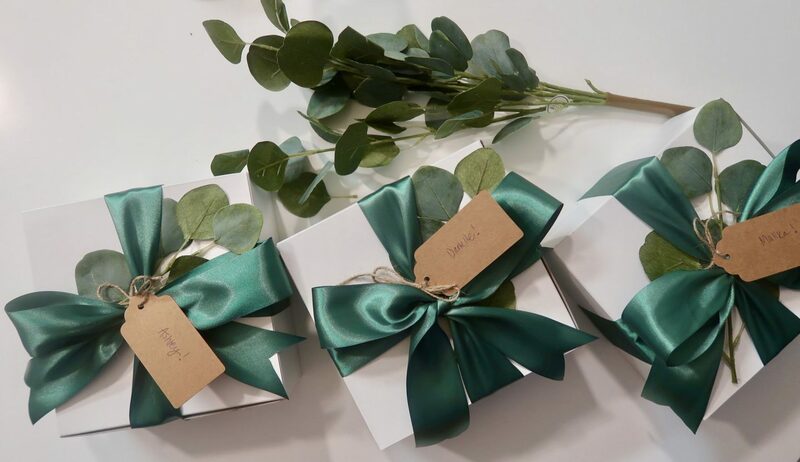 A bridesmaid proposal box is basically a gift for each person you want to participate as a bridesmaid, maid of honor or matron of honor in your wedding. 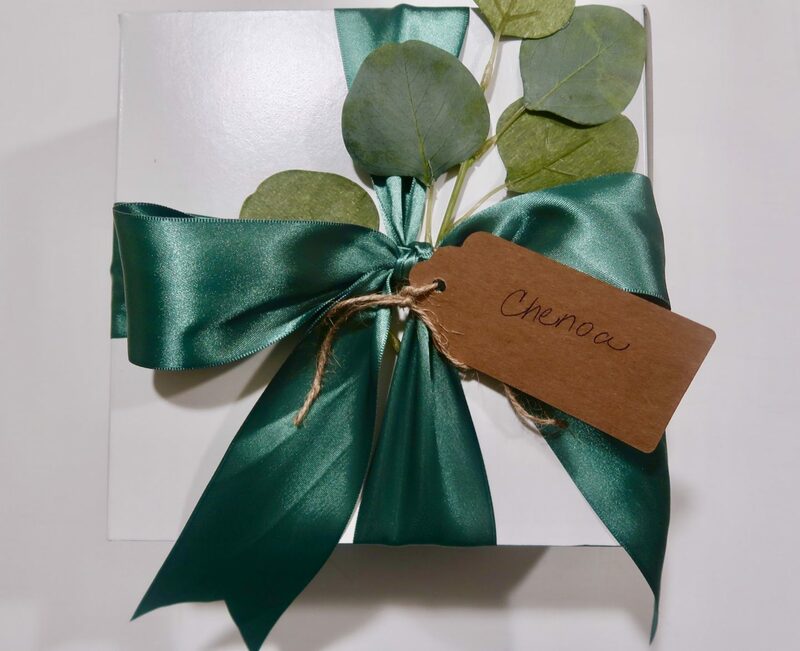 There are so many different ways you can prepare the bridesmaid proposal boxes but I knew I wanted it to go with the theme of the wedding and give the girls a few of my favorite things all surrounding the Green them since that’s my future last name (with an e at the end). When researching the proposal box idea, I came across so many different options. There are companies out there that actually make the boxes for you and ship them to your bridesmaids. At first glance this looked like the best option but the cost of this service is astronomical and when you have 6 bridesmaids like myself that just wasn’t an option. Instead, I decided to make the proposal boxes myself. Where did I get the actual bridesmaid proposal boxes? I looked everywhere possible for the actual box at a good price. The clear winner of this search was etsy. The boxes came really fast and they were super easy to assemble. I would recommend going with this option if you just want a simple white box as your base. What was the content of the proposal boxes? I also went back and forth on the content for quite some time. At first, I really wanted to include candles because that’s one of my favorite things, but that expense quickly started to add up and with the size of my boxes the candle I wanted to use was too large. After some brainstorming, I landed on doing body products that had “green” as a theme in the packaging. I chose the natural brand Nubian Heritage and used their body lotion and body wash as a base. 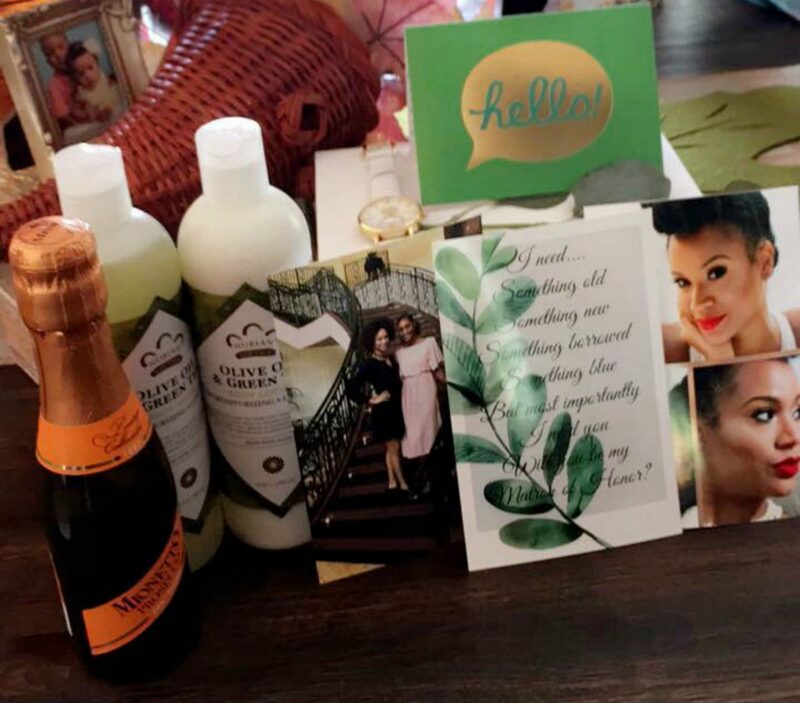 Every bridesmaid deserves to nourish her skin and feel pampered and I thought these products did the trick. Next, I wanted to play on the proposal piece by adding a watch to the box that spoke to diamonds or a proposal. I decided on this amazing Kate Spade watch style that had an engagement ring on the dial and the phrase “diamonds will do” on the inside of the ring. The watch was also white so I thought that was perfect! As a final touch, I wanted to put a mini bottle of prosecco in the boxes because bubbles are my favorite and obviously being engaged is a celebration so it made perfect sense. I also made my own bridesmaid proposal card using picmonkey and left a handwritten note in the box with photos that I love of each girl. What tools and accessories did I use to make the box? I went on HobbyLobby.com to get the emerald satin ribbon as emerald is one of the colors for our wedding. The ribbon looked good online but in person it was just pure luxury. It was so rich in color and the satin feel of the fabric was the perfect addition to the box. I also got on HobbyLobby the faux eucalyptus flower that I hot glued on the outside of the box to add to the foliage theme that we will have at our wedding. Also from HobbyLobby I got the mini hot glue gun and the box filler paper. HobbyLobby is the GOAT. I had no idea this place even existed. But it doesn’t even matter if you have one in your area, all you need to do is go on their website and order everything you need. It’s basically a cheaper version of Michaels and they always have coupons! I love it. Lastly, I went on amazon to get the gift box tag and twine to make the boxes a little more personal. How long did the process take me? From start to finish, it did take a me couple of weeks. From thinking of the product to ordering it and then putting it all together, it takes time. 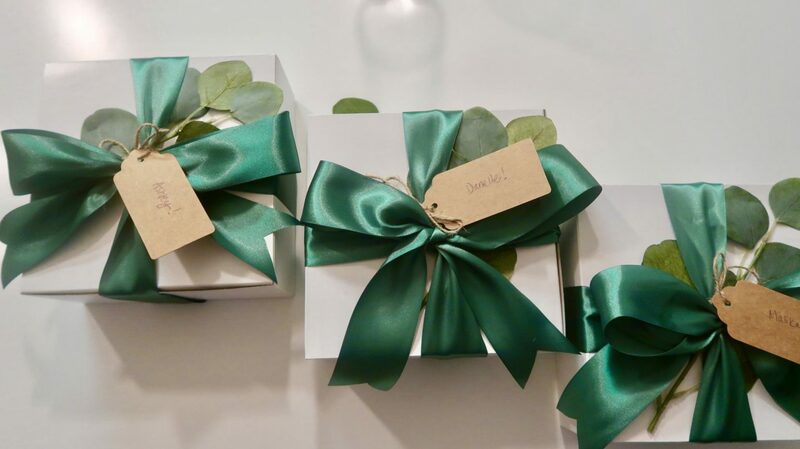 If you want to go the route of sending out proposal boxes to your bridesmaids, I would recommend that you start to think about it very soon after getting engaged because you need to account for the time it will take to get all the resources together in addition to actually shipping your boxes out to bridesmaids who might not be local. Lucky for me only 2 bridesmaids are long distance so I only had to ship those boxes. All the other bridesmaids proposal boxes were delivered in person and the reaction was everything I wanted and more. At the end of the day, it’s not about the box, the gifts or how you ask your bridesmaids to be apart of your wedding. It’s all about making them feel special and telling them why you want them to participate. This is a major time in your life but bridesmaids do not owe you anything as far as saying yes. I am honored to have each girl be apart of our wedding day because I know they did not have to say yes but I am so grateful that they did. I want to know, are you recently engaged? If so, are you thinking about making proposal boxes for your bridesmaids? Let me know below in the comments what you did for your box and how your bridesmaids reacted. 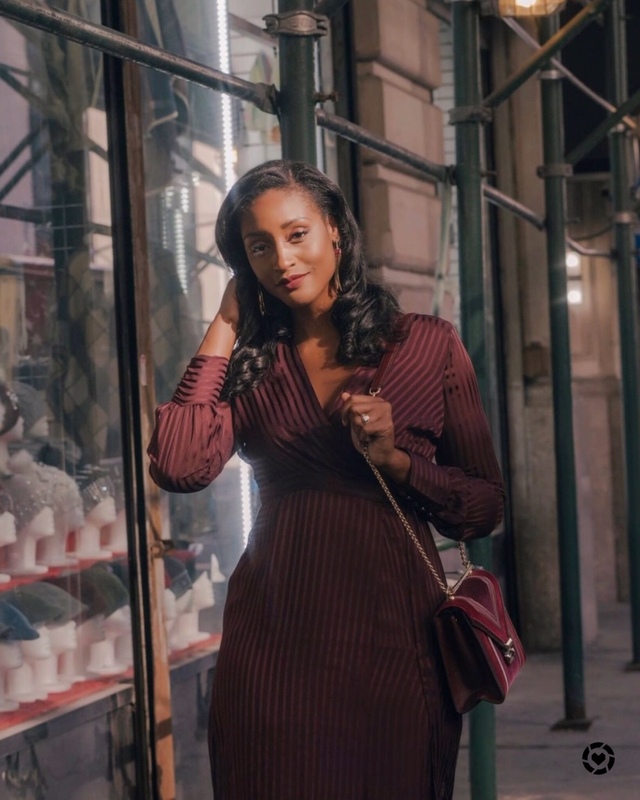 Did you miss my engagement announcement? Click here to read more.